Post #6: To revisit the notion of risk-neutral pricing. The idea of risk-neutral pricing is that the binomial option pricing formula can be interpreted as a discounted expected value. In risk-neutral pricing, the option value at a given node is a discounted expected payoff to the option calculated using risk-neutral probabilities and the discounting is done using the risk-free interest rate. Then the price of the option is calculated by working backward from the end of the binomial tree to the front. Even though the risk-neutral probabilities are not the true probabilities of the up and down moves of the stock, option pricing using risk-neutral probabilities is the simplest and easiest pricing procedure and more importantly produces the correct option price. In this post, we examine why this is the case. In the post #1 on the binomial option pricing model, the following option pricing formula is derived (formula (4) in that post). The values of and sum to 1 and are positive (discussed in the post #2 on the binomial option pricing model). Thus they can be interpreted as probabilities. The value inside the parentheses in (1) can thus be interpreted as the expected value of the option payoff in the next period that follows a given node. The formula (1) uses the risk-free rate to discount the expected value back to that given node. Using this formula, the price of the option is calculated by working backward from the end of the binomial tree to the front. Using formula (1) in this recursive fashion is called the risk-neutral pricing. From a computational standpoint, formula (1) is clear. Something is peculiar about the expected value calculation and the discounting in formula (1). The expected value is calculated using and . What is ? Is it really the probability that the stock will go up? There is no reason to believe that is the true probability of an up move in the stock price in one period in the binomial tree. Why is the true probability of stock price movement not used? On the other hand, the expected value is counted from one period to the previous period using the risk-free rate. In the earlier posts on the binomial pricing model, we see that an option is equivalent to a leverage investment in the stock (e.g. a call is equivalent to borrowing the amount to partly finance the purchase of shares). Thus an option is riskier than the stock. It is natural to think that discounting the value of an option should be done using the risk-free rate and instead using a rate of return equivalent to the option. Our goal in this post is to show that the risk-neutral pricing approach produces the same option price as from using the more standard approach of using a true probability of a stock price up move and using a realistic discount rate. Even though using the more standard approach is possible, it is more cumbersome. Thus the risk-neutral pricing approach is easy to implement and produces the correct price. There is no reason to not use risk-neutral pricing. Let’s look at the implication of investing in a risk-neutral world. Imagine a world where investors are indifferent between a sure thing and a risky investment as long as both investments have the same expected value. For example, one investment pays $25 with certainty. Another investment with equally likely payoff of $50 or $0. Both investments have the same expected value but the second one is much riskier. Normally a risk premium is needed in order to entice a risk-averse investor to hold the second investment. In a risk-neutral world, investors are indifferent between these two investment choices. We further assume that in a risk-neutral world investors are willing to hold risky assets without a risk premium, i.e. risky assets such as stock are expected to earn at the risk-free rate. which is exactly the risk-neutral probability of an up stock move in formula (2) above. Thus is the probability of an increase in the stock price in the scenario that the stock is expected to earn the risk-free rate. This is the reason that is called the risk-neutral probability of a up move in stock price. Thus the risk-neutral pricing procedure is the realistic method for pricing options in a risk-neutral world. But we do not live in a risk-neutral world. Most investors will demand a risk premium in order to bear risk. We show that risk-neutral pricing is also a realistic method of pricing in a world where investors are risk-averse. When we use risk-neutral pricing formula to price options, we are not saying that every investor is risk-neutral. Risk-neutral pricing is only an interpretation to formula (1). The best reason for using it is that it gives the correct result and is much easier to implement as compared to the more standard approach discussed below. Suppose that investors do care about risk. As a result, we want to calculate an expected value of payoff using true probability of stock price movements and using the expected rate of return of the option to discount the expected value of payoff. Recall that an is equivalent to the portfolio of holding shares of stock and the amount in lending (this is called the replicating portfolio). The make-up of the replicating portfolio is determined from the idea of replication: equating the option values and the values of the replicating portfolio, i.e. from solving the following equations. So the determination of and has nothing to do with or . Let’s recap the journey it takes to get the option price in (10). We assume an expected rate of return for the stock in question, which leads to a probability for an up movement in the stock. The actual probability allows us to compute the expected option value in (7). To find the expected rate of return of the option, we take the weighted average of the returns of the stock and lending in the replcating portfolio. Then equation (1) gives the discounted value of the expected option value. One peculiar thing happens in the process of obtaining the answer in (10). We can obtain and by solving the equations in (9). Then we would have obtained the option price . Doing so does not require knowing , the expected return of the stock, or , the real probability of an up move in stock price. If the goal is to obtain the option price, the steps for obtaining and are redundant! The ultimate reason that , and are not necessary is that the option price in (10) is the same as the option price obtained from using risk-neutral pricing, i.e. equation (1). We verify this fact in the next section. Then we examine some examples. The above derivation shows that the content inside the big parentheses in (11) is identical to . This means that (10) is identical to . Therefore it is not necessary to use real stock price probability and real discount rate to calculate the option price. When we do, we know that the result is the same as from using the risk-neutral pricing method. We now examine examples to illustrate the point that risk-neutral pricing and valuation approach using true probabilities and true discount rate produce the same option price. We take two examples from previous posts and compare the two valuation approaches. This is Example 1 in the post #4 on the binomial option pricing model. The example is to price a 1-year call stock option with strike price $55. For the other details of this example, see Example 1 in the other post. Price this call option assuming that the expected annual rate of return of the stock is 12%. Compare this pricing with the risk-neutral pricing. The following is the binomial tree obtained by using risk-neutral pricing. The following shows the calculation for the probability associated with the expected rate of stock return 0.12. Next find the rate of return of option at each node. Because the compositions of the replicating portfolio are different across the nodes, the option rate of return is different. We are now ready to calculate the option value at each node. Note that the option price produced from the alternative approach is the same as from the risk-neutral approach. The following binomial tree shows all the results. This is Example 1 in the post #5 on the binomial option pricing model. Example 1 in that post is to price a 6-month American put option in a 3-period binomial tree. The strike price of the option is $45. The following shows the specifics of the binomial trees. The initial stock price is $40. The annual risk-free interest rate is 0.05. The stock pays no dividends. The annual countinuously compounded standard deviation of stock return is 0.3. Price this 6-month put option assuming that the expected annual rate of return of the stock is 15%. Compare with the results from Example 1 in the previous post. The following is the binomial tree from the previous post showing option price based on risk-neutral pricing. Since this is for an American option, early exercise is permitted if it is optimal to do so. 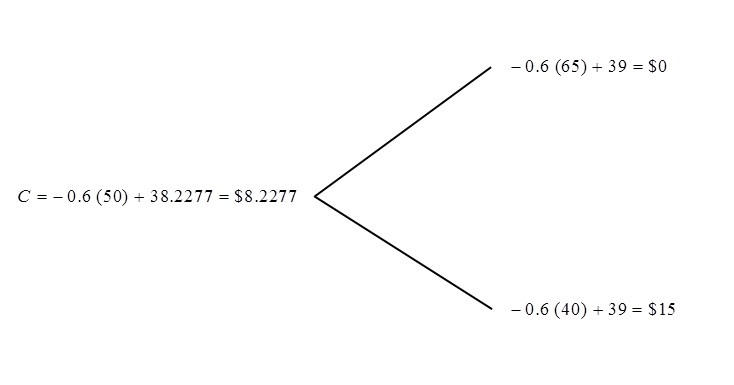 There are two nodes in the following tree where early exercise is optimal (the option value is in bold). For option valuation using true probabilities, the calculation at each node is also an either-or proposition, i.e. the option value is either the value from the discounted expected value using probabilities or the value from early exercise. The pricing results from using true probabilities will be identical to the risk-neutral pricing results. We will not show a diagram for the binomial tree. Instead, we show the calculation on some nodes. The following shows the calculation for the probability associated with the expected rate of stock return 0.15. The following is the calculation at the node where the stock price is $40.67225. At the node where the stock price is = 31.83598, early exercise is optimal. There is no need to calculate the option value here using true probabilities. However, it is possible to calculate if it is desirable to do so. This is done by solving for in equation (10). At the node where stock price is $35.68528, early exercise is also optimal. So the option value is not obtained by a discounted expected value (risk-neutral probabilities or otherwise). We now look at the initial node. The proof shown above and the calculation in the two examples show that option valuation using true probabilities based on the expected rate of return of the stock is not necessary. Risk-neutral pricing will produce the same results with much simpler and easier calculation. One peculair point about option valuation using true probability and true discount rate that should be mentioned again. To discount the expected value of the option, we need to find the rate of return of the option at each node. To find the rate of return for the option at each node, we make use of the replicating portfolio and . By knowing and , we can derive the option value directly by . Then we are done. Unless the goal is to find the expected return of an option, the valuation approach of using real probability and actual rate of return of option is pointless. Practice problems to be added. Post #5: Tweak the binomial European option pricing methodology to work for American options. The work in this post is heavily relying on the work in the binomial option pricing model for European options (multiperiod, one-period and more on one-period). The binomial tree approach of pricing options can also be used to price American options. Recall that a European option can be exercised only at expiration. An American option is one that can be exercised at any time during the life of the option. This means that in a binomial tree, an European option can be exercised only at the final nodes while an American option can be exercised at any node if it is profitable to do so. For an American option, the option value at a given node is obtained by comparing the exercise value (i.e. the value of the option if it is exercised at that node) and the intrinsic value (the value of the option resulting from the binomial model calculation). Thus for an American option, the option value at each node is simply the greater of the exercise value and the intrinsic value. The following 3-step process summarizes the approach in pricing an American option. Calculate the option values at the last nodes in the tree. For a call, the option value at the end of the tree is either the stock price less the strike price or $0, whichever is greater. For a put, the option value at the end of the tree is either the strike price less the stock price or $0, whichever is greater. Starting from the option values at the final nodes, work backward to calculate the option value at earlier nodes. The option value at the first node is the price of the option. Keep in mind at each node, the option value is either the intrinsic value (the value calculated using the binomial pricing method) or the exercise value, whichever is the greater. The three-step process is almost identical to the process of European option valuation discussed in binomial model post #4. The tweak is in Step 3, allowing for early exercise at any node whenever it is advantageous to do so (for the option holder). where is the annual risk-free interest rate, is the length (in years) of a period in the binomial tree, and are the stock price movement factors and is the stock price volatility factor. The risk neutral pricing is discussed in binomial model post # 2. The binomial tree pricing process produces more accurate results when the option period is broken up into many binomial periods. Thus the binomial pricing model is best implemented in computer. In order to make a binomial tree a more realistic model for early exercise, it is critical for a binomial tree to have many periods when pricing American options. Thus the examples given here are only for illustration purpose. Price this put option with a 3-period binomial tree. Compare the American option with the European but otherwise identical put option. Compare the following two binomial trees. The first one is for the American put option. The second one is for the otherwise identical European put option. At the node where the stock price is 31.83598158, the option value for the American option is in bold and is greater than the option value in the tree for the European option. This is due to the fact that early exercise is possible in the tree for the American option. When early exercise is possible, the put option value at that node is $45 – $31.83598158 = $13.16401842. As a result of the early exercise in one node, the price of the American put option is $6.0044 whereas the price of the option if early exercise is not permitted is $5.7877. Consider Example 3 in the binomial model post #4. That example is to price a 6-month European call option in a 3-period binomial tree. The following shows the specifics of this call option. What is the price if early exercise is possible? The following is the binomial tree for the European call option from Example 3 in the previous post. Observe that early exercise is optimal at none of the nodes in this binomial tree. In this example, the American call option and the European call option have the same price (when suing a 3-period binomial tree). Initial stock price is $75. Strike price of the call option is $72. The stock pays continuous dividends at the annual rate of 0.06. The annual risk-free interest rate is 3%. Price this call option in a 3-period binomial tree. Also compute the price for the European call with the same characteristics. Observe that early exercise is optimal at the node where the stock price is $117.6114109. If early exercise is not allowed, the following is the binomial tree. Practice problems can be found in the companion problem blog. Post #3: Discuss the role of Delta ( ) in the replicating portfolio for an option. This number is also called the hedge ratio. In this post, the hedge ratio is discussed in the context of the one-period binomial option model. Suppose that a market maker sells an option (on a stock). He is on the hook to sell (or buy) shares of the stock if the call (or put) buyer decides to exercise (i.e. when the share price of the underlying stock is above (or below) the strike price). He can hedge the risk of a short option position by creating a long synthetic option, i.e. creating a portfolio that replicates the same payoff of the option he sold. This replicating portfolio consists of shares of the stock and an appropriate amount of lending or borrowing. The is also called the hedge ratio and is the number of shares in the replicating portfolio to hedge away the risk from selling an option. Let’s discuss through two examples. Suppose that the future prices for a stock are modeled with a one-period binomial tree with 1.3 and 0.8 and having a period of 6 months. The current price of the stock is $50. The following is the binomial tree shows the future state of the stock prices. The stock pays no dividends. The annual risk-free interest rate is 4%. Determine the price of a European 55-strike call option on this stock that will expire in 6 months. What is the replicating portfolio for this call option. This is Example 1 in the post #1 on binomial model. At the end of 6 months, the stock price is either $65 or $40 and the value of the option is either $10 (if stock price goes up) or $0 (if price goes down). According to the calculation in the previous post, the replicating portfolio consists of holding 0.4 shares of the stock and $15.6832 in borrowing. The price of the call option is 50(0.4) – 15.6832 = $4.3168. The market maker makes $4.3168 per call option sold. But the market maker is also at risk of losing $10 (selling a share at $55 for a share that is worth $65) when the call buyer decides to exercise. To hedge this risk, the market maker can buy a synthetic call option that replicates exactly the call option he sold. For every call option written by the market maker, 0.4 shares of stock must be held to hedge away risk. The reason is that the strategy of holding 0.4 shares and the borrowing of $15.6832 has the same payoff as the call option as indicated by the following two equations. Note that $16.00 is the end of period value of $15.6832. The above two equations show the payoff of the replicating portfolio of holding 0.4 shares and the borrowing of $15.6832, which is exactly the same as the payoff of the call option in the example. By selling a call option in this example, the market maker is at risk of losing $10 when the stock price goes up. He can offset the loss by creating a replicating portfolio that gains $10. So a market maker can hedge away the risk from selling a call by buying a synthetic call (the replicating portfolio). The stock pays no dividends. The annual risk-free interest rate is 4%. Consider a European 45-strike put option on this stock that will expire in 6 months. At the end of 6 months, the value of the option is either $0 (if stock price goes up) or $5 (if price goes down). According to the calculation in the previous post, the replicating portfolio consists of holding -0.2 shares of the stock and $12.74258275 in lending. The price of the call option is 50(-0.2) – 12.74258275 = $2.742582753. The market maker makes $2.74258 per put option sold. But the market maker is also at risk of losing $5 (buying a share at $45 for a share that is worth only $40) when the put buyer decides to exercise. To hedge this risk, the market maker can buy a synthetic put option that replicates exactly the put option he sold. The hedge ratio is negative. So instead of buying stock, like in Example 1, the market maker holds a short position in the stock, i.e. enter into a short sale for the stock. This means that the market maker borrows the shares and sell the borrowed shares for cash. A short position is a bearish position, i.e. investor enters into a short position in the hope that the price of the asset will fall. In this example, the market maker uses a short stock position because the payoff of a short stock position is exactly opposite of the payoff of a short put, i.e. the loss experienced by the market maker in the short put position is exactly offset by the gain in the short stock position. Back to the example. For every put option written by the market maker, 0.2 shares of stock must be sold short to hedge away risk. The reason is that the strategy of shorting 0.2 shares and the lending of $12.74258 has the same payoff as the put option as indicated by the following two equations. Note that $13.00 is the end of period value of $12.74258. The above two equations show the payoff of the replicating portfolio of shorting 0.2 shares and the lending of $12.74258, which is exactly the same as the payoff of the put option in the example. By selling a put option in this example, the market maker is at risk of losing $5 when the stock price goes down. He can offset the loss by creating a replicating portfolio that gains $5. So a market maker can hedge away the risk from selling a put by buying a synthetic put (the replicating portfolio). Here’s the observation from the above two examples. From the perspective of a market maker, the hedge ration is the number of shares of stock required to hedge the price risk from selling an option. When selling a call option, the hedge ratio is positive, indicating that the marker maker is to hedge away the risk of a short call by going long on shares of stock with an appropriate amount in borrowing. When selling a put option, the hedge ratio is negative, indicating that the marker maker is to hedge away the risk of a short put by going short on shares of stock with an appropriate amount in lending. The initial stock price in Example 1 and Example 2 is $50. In Example 1, the strike price of the call option is $55. Given the price position, there is no incentive for the call option buyer to exercise when the stock price is $50. The strike price of the put option in Example 2 is $45. So there is no incentive for the put option buyer to exercise when the stock price is $50. In other words, both options are out of the money. When can we say about the hedge ratio when the options are increasingly in the money? For the call option in Example 1, what if the initial stock price is not $50 but is higher, say $55, $60, $65, or $70? For these higher initial stock prices, the option will have an increasingly greater chance of being in the money. What can we say about ? We examine these scenarios in Example 3. In Example 4, we will examine similar scenarios for the put option in Example 2. For the call option in Example 1, determine the replication portfolio and calculate the price of the call option as the initial stock price varies from $50, $55, $60, $65, to $70. The results are in the following table. In Table 1, the initial stock prices are increasingly higher than the strike price. This means that the call option is increasingly in the money. As a result, the hedge ratio is increasingly becoming 1.0. To explain this phenomenon, let’s take the point of view of a market maker. Suppose that a market maker has sold a 55-strike call option. If the initial stock price is much higher than the strike price, it is much more likely that the option will finishes in the money. The market maker must then buy more shares initially in order to be able to cover the obligation of the short call position at expiration. Thus the hedge ratio increases as the initial stock price increases. When is 1, the option is all but certain to expire in the money that the market maker has to hedge by holding one share for one option. For the put option in Example 2, determine the replication portfolio and calculate the price of the put option as the initial stock price varies from $50, $45, $40, $35, to $30. The results are in the following table. In Table 2, the movement goes in the opposite direction. The initial stock prices are decreasingly lower than the strike price. This means that the put option is increasingly in the money. As a result, the hedge ratio is increasingly becoming -1.0. To explain this phenomenon, we again take the point of view of a market maker. Suppose that a market maker has sold a 45-strike put option. If the initial stock price is much lower than the strike price, it is much more likely that the put option will finish in the money. The market maker must then short more shares initially in order to be able to cover the obligation of the short put position at expiration. Thus the hedge ratio decreases as the initial stock price decreases. When is -1, the put option is all but certain to expire in the money that the market maker has to hedge by shorting one share for one option. The discussion of in this post is from a market maker’s point of view. It is the number of shares a market maker needs to buy or short in order to cover the obligation of a short option position. When the initial price is sufficiently far from the strike price (when the option is extremely likely to expire in the money), the market maker must buy or short the stock on a one share to one option basis. Practice problems for this post are found in here. Post #2: Discuss the underlying issues in the one-period model – e.g. arbitrage in the binomial tree and risk-neutral pricing. For easier reference, we list out the option pricing formulas derived in part 1. 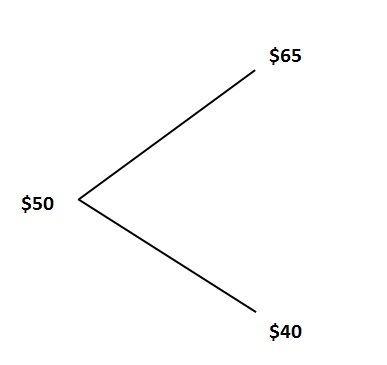 The binomial tree models the stock price at expiration of the option. 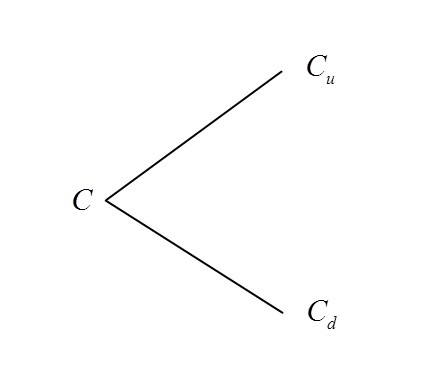 The following is a tree showing the value of the option at expiration. In formulas (1), (2) and (4), it seems that we choose the up factor and the down factor arbitrarily. It turns out that the assumed stock price factors and should be set in such a way that arbitrage opportunities are not possible. The factors and must follow the following relationship. The middle term in (6) is the forward price on the stock. The relationship (6) indicates that whatever the values of the up factor and the down factor are, the end of period upped stock price must be larger than the forward price and the downed stock price must be below the forward price. Violation of this requirement will yield arbitrage opportunities. Based on the above inequality (a), the arbitrage opportunity: short shares of stock (borrow that many shares and sell) and lend (the short sales proceeds). At time , you need to buy back 1 share at price . The value of the bond is . What occurs at time is that you pay to buy back 1 share and receive . Based on (a), both and , which mean risk-free profit. So it must be the case that . The arbitrage opportunity: borrow at the risk-free rate and use the borrowed fund to buy shares of stock. The relationship (b) says that regardless of the stock price at time (up or down), the stock price is always greater than the amount that has to be repaid. Thus there are risk-free profits in either case: and . For more information about (7), see part 1. At first glance, the pricing of an option on stock ought to require the use of a probability model. The price of the option depends on the price of the stock at expiration of the European option. The stock price at the end of the option period is uncertain. Thus to price the option, we need to find a way to characterize the uncertainty of the stock prices at expiration. Since the future stock prices are random, it is natural to think that we need a probability model to describe the uncertain stock prices. The above derivation of the binomial option pricing model shows that probabilities of the future stock prices are not necessary. All we use is the binomial assumption of stock prices. The trick is then to determine a replicating portfolio of holding shares and lending a dollar amount . Because the replicating portfolio has the same payoff as the option, the movement of the stock prices (the up and the down prices) is irrelevant to the calculation of the price of the option. The formula is called the risk-neutral probability. From a calculation standpoint, the risk-neutral probability is another way to calculate the price of an option in the one-period binomial model. Simply calculate the risk-neutral probabilities. Then use them to weight the option values and (and also discount to time 0). If and are interpreted as probabilities, then the pricing formula (5) says that the price of an option is the expected value of the end of period options values discounted at the risk-free rate. On the other hand, let’s use and to compute the expected value of the stock prices. The last term in the above derivation is , which is the forward price on a stock that pays continuous dividends (derived in this previous post). Thus if we use and to calculated the expected value of the stock prices, we get the forward price. This is why and are called risk-neutral probabilities since they are the probabilities for which the expected value of the stock prices is the forward price. In particular, is the risk-neutral probability of an increase in the stock price. We conclude this post with an example on using risk-neutral probabilities to compute option prices. This example is Example 3 in part 1. Suppose that the future prices for a stock are modeled with a one-period binomial tree with volatility 30% and having a period of 6 months. The current price of the stock is $60. The stock pays no dividends. The annual risk-free interest rate is 4%. Use risk-neutral probabilities to price the following options. A European 60-strike call option on this stock that will expire in 6 months. A European 60-strike put option on this stock that will expire in 6 months. Practice problems can be found in in this blog post in a companion blog. Post #1: Describe the option pricing formulas in the one-period binomial model. We first consider the pricing of options on stock. The most important characteristic of the binomial option pricing model is that over a period of time, the stock price is assumed to follow a binomial distribution, i.e. the price of the stock can only take on one of two values – an upped value and a downed value. In this post, we describe how to price an option on a stock using this simplifying assumption of stock price movement. The current share price is . If the stock pays dividends, we assume the dividends are paid at an annual continuous rate at . At the end of a period of length (in years), the share price is either or , where is the up factor and is the down factor. The factor can be interpreted as one plus the rate of capital gain on the stock if the stock goes up. The factor can be interpreted as one plus the rate of capital loss if the stock goes down. If , the end of period share price is or . This is to reflect the gains from reinvesting the dividends. Of course if , the share prices revert back to the previous bullet point. 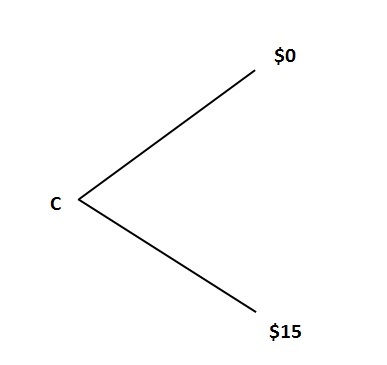 The end of period stock prices are shown in the following diagram, which is called a binomial tree since it depicts the 2-state stock price at the end of the option period. Now consider a European option (either call or put) on the stock described above. When the stock goes up, we use to represent the value of the option. When the stock goes down, we use to represent the value of the option. The following is the binomial tree for the value of the option. This portfolio is supposed to replicate the same payoff as the value of the option. By equating the portfolio payoff with the option payoff, we obtain the following linear equations. The price of the option described above is , either given by formula (3) or formula (4). One advantage of formula (4) is that it gives the direct calculation of the option price without knowing and . Of course, if the goal is to create a synthetic option for the purpose of hedging or risk management, it will be necessary to know the make up of the replicating portfolio. The calculated in (1) is also called the hedge ratio and is examined in greater details in in this subsequent post. Let’s walk through a quick example to demonstrate how to apply the above formulas. Suppose that the future prices for a stock are modeled with a one-period binomial tree with 1.3 and 0.8 and having a period of 6 months. The current price of the stock is $50. The stock pays no dividends. The annual risk-free interest rate is 4%. Determine the price of a European 55-strike call option on this stock that will expire in 6 months. Determine the price of a European 45-strike put option on this stock that will expire in 6 months. The two-state stock prices are $65 and $40. The two-state call option values at expiration are $10 and $0. Apply (1) and (2) to obtain the replicating portfolio and then the price of the call option. The replicating portfolio consists of holding 0.4 shares and borrowing $15.68317877. The replicating portfolio consists of shorting 0.2 shares and lending $12.74258275. Example 1 is examined in greater details in this subsequent post. What if the observed price of an option is not the same as the theoretical price? In other words, what if the price of a European option is not given by the above formulas? Because we can always hold stock and lend to replicate the payoff of an option, we can participate in arbitrage when an option is mispriced by buying low and selling high. The idea is that if an option is underpriced, then we buy low (the underpriced option) and sell high (the corresponding synthetic option, i.e. the replicating portfolio). On the other hand, if an option is overpriced, then we buy low (the synthetic option) and sell high (the overpriced option). Either case presents risk-free profit. We demonstrate with the options in Example 1. Suppose that the price of the call option in Example 1 is observed to be $4.00. Describe the arbitrage. Suppose that the price of the call option in Example 1 is observed to be $4.60. Describe the arbitrage. For the first scenario, we buy low (the option at $4.00) and sell the synthetic option at the theoretical price of $4.316821227. Let’s analyze the cash flows in the following table. The above table shows that the buy low sell high strategy produces no loss at expiration of the option regardless of the share prices at the end of the option period. But the payoff at time 0 is certain: $4.316821227 – $4.00 = $0.316821227. For the second scenario, we still buy low and sell high. This time, buy low (the synthetic call option at $4.316821227) and sell high (the call option at the observed price of $4.60). Let’s analyze the cash flows in the following table. The above table shows that the buy low sell high strategy produces no loss at expiration of the option regardless of the share prices at the end of the option period. But the payoff at time 0 is certain: $4.60 – $4.316821227 = $0.283178773. These two examples show that if the option price is anything other than the theoretical price, there are arbitrage opportunities and there is risk-free profit to be made. In the binomial tree in Figure 1, we assume that the share price at expiration is obtained by multiplying the original share price by the movement factors of and . 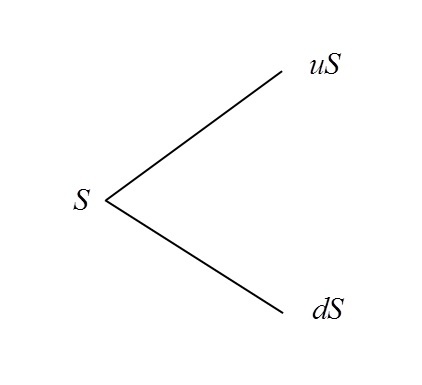 The binomial tree in Figure 1 may give the impression that the choice of the movement factors and is arbitrary as long as the up factor is greater than 1 and the down factor is below 1. In the next post, we show that and have to satisfy the following relation, else there will be arbitrage opportunities. Thus the choice of and cannot be entirely arbitrary. In particular the relation (5) shows that the future stock prices have to revolve around the forward price. The purpose pf the factors and in the binomial tree is to incorporate uncertainty of the stock prices. In light of (6), we can set and by applying some volatility adjustment to . We can use the following choice of and to model the stock price evolution. is the standard deviation of the continuously compounded stock return over a period of length . The standard deviation measures how certain we are that the stock return will be close to the expected return. There will be a greater chance of a return far from the expected return if the stock has a higher . If , then there is no uncertainty about the future stock prices. The formula (7) shows that when , the future stock price is precisely the forward price on the stock. When the binomial tree is constructed using (7), the tree will be called a forward tree. A note on calculation. If a problem does not specific and but assume a standard deviation of stock return , then assume that the binomial tree is the forward tree. We now use a quick example to demonstrate how to price an option using the forward tree. Everything is the same as Example 1 except that the up and down stock prices are constructed using the volatility 30% (the standard deviation ). The following calculates the stock prices at expiration of the option. Using formulas (1), (2) and (3), the following shows the replicating portfolio and the call option price. Note that the binomial tree is based on a different assumption than that in Example 1. The option price is thus different than the one in Example 1. The replicating portfolio consists of holding 0.369847654 shares and borrowing $14.95770971. The following shows the calculation for the put option. The replicating portfolio consists of shorting 0.171529678 shares and lending $10.60320232. We present two more examples in illustrating the calculation in the one-period binomial option model where the stock prices are modeled by a forward tree. The stock price follows a 6-month binomial tree with initial stock price $60 and 0.3. The stock is non-dividend paying. The annual risk free interest rate is 4%. What is the price of a 6-month 55-strike call option? Determine the replicating portfolio that has the same payoff as this call option. We will use risk-neutral probabilities to price the option. The replicating portfolio consists of holding 0.79025 shares and borrowing $38.352. The stock price follows a 3-month binomial tree with initial stock price $40 and 0.3. The stock is non-dividend paying. The annual risk free interest rate is 5%. What is the price of a 3-month 45-strike put option on this stock? Determine the replicating portfolio that has the same payoff as this put option. The calculation is calculated as in Example 3. The replicating portfolio consists of shorting 0.831269395 shares and lending $38.63188995. The discussion in this post is only the beginning of the binomial pricing model. The concepts and the formulas for the one-period binomial option model are very important. The one-period model may seem overly simplistic (or even unrealistic). One way to make it more realistic is to break up the one-period into multiple smaller periods and thus produce a more accurate option price. The calculation for the multi-period binomial model is still based on the calculation for the one-period model. Before moving to the multi-period model, we discuss the one-period model in greater details to gain more understanding of the one-period model. This post is a continuation of the example discussed in this previous post, which gives an example to illustrate the pricing of a call option using the binomial option pricing model. This post illustrates the pricing of a put option. Links to practice problems are found at the bottom of the post. The stock of XYZ company is currently selling for $50 per share. The price per share 1 year from now is expected to increase to $65 or to decrease to $40. The stock pays no dividends. The underlying asset of the put option is the XYZ stock. The strike price is $55. The option will expire in one year. The option is assumed to be a European option, i.e. it can be exercised only at expiration. The annual risk-free interest rate is 2%. There is a benefit to the buyer of the option described above. If the price of the stock goes down to $40 at the end of the 1-year period, the buyer of the put option has the right to sell a share of XYZ for $55 ($15 higher than the market price). If the price of the stock goes up to $65 at the end of the 1-year period, exercising the option would mean selling a share at $55 which is $10 below the market price, but the put option owner can simply walk away. The put option owner sells the stock only when he makes money. What would be the fair price of having this privilege? What is the fair price of this put option? In this example, the current stock price is $50 and the stock price can be only one of the two possible values at the end of the option contract period (either $65 or $40). The following diagram shows the future state of the stock prices. The assumption of the 2-state stock prices in 1 year simplifies the analysis of the put option. The value of the put option at the end of 1 year is either zero or $15 (=55-40). Note that when the share price at the end of the 1-year contract period is higher than the strike price of $55, the put option expires worthless. The following diagram shows the value of the put option. Short 0.6 shares of XYZ. Lend $38.2277 at the risk-free rate. The idea for setting up this portfolio is given below. For the time being, we take the 0.6 shares and the lending of $38.2277 as a given. Note that $38.2277 is the present value of $39 at the risk-free rate of 2%. Let’s calculate the value of Portfolio B at time 0 and at time 1 (1 year from now). The following diagram shows the calculation. Note that the payoff of the put option is identical to the payoff of Portfolio B. Thus the put option in this example and Portfolio B must have the same cost. Since Portfolio B costs $8.2277, the price of the option must be $8.2277. The Portfolio B of 0.6 shares of stock in short sales and $15.683 in lending is a synthetic put since it mimics the put option described in the example. Portfolio B is called a replicating portfolio because it replicates the payoff of the put option in question. In deriving the cost of the put option of $8.2277, we rely on the idea that if two investments have the same payoff, they must have the same cost. This idea is called the law of one price, which is a commonsensical idea and is also an important principle in derivative pricing. If the law of one price is violated, in particular if the price of the put option discussed here is not $8.2277, there would be arbitrage opportunities that can be exploited to gain risk-free profit. What if the law of one price is violated? For example, what if the option were selling for a higher price (say $8.50)? If the price of the replicating portfolio is less than the price of the option, then we can “buy low and sell high” (i.e. buy the replicating portfolio and sell put option) and obtain a risk-free profit of $0.2723. The arbitrage is to buy the synthetic call (Portfolio B) at $8.2277 and sell the put option at $8.50. The following table shows the Year 1 cash flows of this arbitrage opportunity. The above table shows that buying a synthetic put (shorting 0.6 shares and lending $38.2277) and selling a put will have no loss at the end of 1 year. Yet, the time 0 cash flow is $0.2723 (=8.50 – 8.2277), and is thus a risk-less profit. If the option is underpriced, then we can still buy low and sell high (in this case, buy put option and sell the replicating portfolio) and obtain risk-free arbitrage profit. For example, let’s say you observe a put option price of $8.00. Then the arbitrage opportunity is to buy the put option at $8.00 and sell a synthetic put (Portfolio B) at $8.2277. The time 0 payoff is $0.2723, which is a risk-less arbitrage profit. The following table shows the Year 1 cash flows. The put option price of $8.2277 is derived by showing that the replicating portfolio has the same payoff as the put option. How do we know that the replicating portfolio consists of shorting 0.6 shares and lending of $38.2277? where is the stock price at expiration. The above formula gives the cost of the portfolio replicating the payoff of a given option. It works for call option as well as for put option. The above example shows that for put options, is negative and is positive (i.e. shorting stock and lending replicate the payoff of a put). The number has a special interpretation that will be important in subsequent discussion of option pricing. It can be interpreted as the sensitivity of the option to a change in the stock price. For example, if the stock price changes by $1, then the option price, , changes by the amount . In other words, is the change in the option price per unit increase in the stock price. The put-call parity relates the price of a European call with a European put that has the same strike price and the same time to expiration. The following is a call on XYZ stock that is compatible to the put described above. The underlying asset of the call option is the XYZ stock. The previous post shows that the premium of this call option is $4.316821227. The put-call parity also derive the same cost for the put. The examples discussed in this post and in the previous post have value even though the examples may seem like an extreme simplification. These two examples are an excellent introduction to the subject of option pricing theory. The one-period example can be extended to a multi-period approach to describe far more realistic pricing scenarios. For example, we can break a year into many subintervals. We then use the 2-state method to describe above to work backward from the stock prices and option values of the last subinterval to derive the value of the replicating portfolio.